FORMER GARDA COMMISSIONER Martin Callinan told solicitor Gerald Kean that garda whistleblower Sergeant Maurice McCabe “had not cooperated in any shape or form” with an internal garda inquiry into his complaints, the Charleton tribunal has heard. The solicitor spoke by phone with the former commissioner several times before a panel appearance on the RTÉ Marian Finucane Sunday Show, on 26 January, 2014. “I mistakenly or otherwise believed the commissioner was somebody beyond reproach,” Kean said. The tribunal is looking at allegations that senior gardaí were smearing the whistleblower to politicians, journalists and others. Kean said he met Callinan in person only once, at a charity event in Cork. He later invited the commissioner to a dinner party, but Callinan was unable to attend due to late notice. Kean said that when he spoke to Callinan before his radio appearance, he was told that Sergeant McCabe had not cooperated with an internal garda inquiry, and that he had breached the Data Protection Act. “I believed I had access at that time to somebody who was beyond reproach,” Kean said. Callinan asked Kean not to disclose the fact that they had spoken. “I was representing my own views, but very much based on the information was in the public domain since October and the information given to me by the commissioner,” Kean said of his RTÉ appearance. Kean said that after he came off air in RTÉ, he was told by a producer that McCabe had called to complain. Kean said this set off “alarm bells” and he rang Callinan. “He stuck to his guns, he said that’s not correct, everything I said is correct,” Kean said. “The commissioner didn’t back down. He was standing his ground on the information he gave me, and I was happy to stand my ground based on that information,” Kean said. McCabe later wrote and complained about the comments Kean made on the programme, saying that he heard them at work and they left him “upset, annoyed and furious”. Kean wrote to the commissioner about the complaint from McCabe, enclosing the sergeant’s letter. “I felt the most appropriate step was to send that to the commissioner because he gave me the information, and ask him for his assistance in response,” Kean said. The tribunal heard that Kean had not disclosed the letter he wrote to the commissioner to its investigators. It was handed in to the tribunal by the Garda Commissioner’s office during their discovery process. Kean told the tribunal he did not remember having the letter when he made discovery to the tribunal. He said at the time he was dealing with his defence to the defamation action, which had since been resolved, and apologised for the error. The tribunal also learned that the Garda Commissioner, in response, prepared a draft containing suggested responses for Kean. Four paragraphs in Kean’s eventual response to Sgt McCabe were based on the draft from Martin Callinan, the tribunal heard. The tribunal was shown a statement from Supt Frank Walsh who said he had met with Kean in February 2014, and showed him the draft from the commissioner, but had not given it to Kean. Afterwards, the handwritten draft and a typed copy were filed in Garda HQ. Kean said that he could have read the contents into the draft into his dictaphone, and this explained how his office was unable to locate a copy of the draft. Kean said that he relied on Callinan’s position as Garda Commissioner when he spoke to him, and added, “I believe in hindsight that he [Callinan] used me to promote a position that supported his stance in the matter and that in my opinion was incorrect, and I ended up in the firing line,” Kean said. Email “'I believe he used me' - Gerald Kean says Martin Callinan spoke to him before RTÉ appearance”. 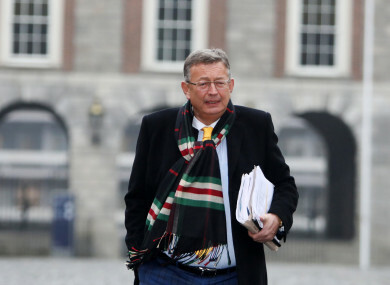 Feedback on “'I believe he used me' - Gerald Kean says Martin Callinan spoke to him before RTÉ appearance”.